Twenty-five years after the murder of Stephen Lawrence some police forces are still institutionally racist, a black officers' leader has said. 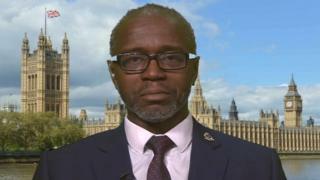 National Black Police Association (NBPA) president Tola Munro said forces needed to do more to recruit black and minority ethnic (BME) officers. Figures show 6.3% of police officers in England and Wales are BME, compared to 14% of the population. The Home Office said it was "clear that there is more for forces to do". Among women the percentage of BME officers is even lower. According to the Home Office's latest data there were 1,863 BME female police officers out of a total of 35,844 - just 1.5% of the total compared to 7% of the population. West Yorkshire Police has now launched a campaign to actively recruit more BME women officers. Mr Munro said: "When the next census figures are out in 2021 it will show that we have fallen further behind. "This is the 20th year since the Macpherson Report, which was a result of the racist murder of Stephen Lawrence which was 25 years ago this April. It's also the 20th anniversary of the setting up of the NBPA. "I think there has been some progress and I'm grateful for the progress and the increasing number of BME officers, but if I was marking policing I would give us a C at the moment. "We within the NBPA would argue that we would consider at least some forces are institutionally racist." Some 31 forces have no women BME officers at a rank higher than inspector. North Yorkshire Police does not have a single female officer from the BME community. Mr Munro said: "There are some forces whose reputation and culture in regards to their BME officers has been, at the least I would say, very poor and that's been reflected by one force who have recruited recently and had no BME applicants at all." In 1999, 2% of police officers in England and Wales were from a BME background, compared to 6.5% of the population. A Home Office spokesman said: "Police forces are more diverse than ever before, but we are clear that there is more for forces to do. "While the government has set strong expectations that forces increase diversity in policing, we are clear that it is local police leaders working with the College of Policing and the National Police Chiefs' Council who are best placed to make this a reality." "My dad was very much 'Oh I don't want my daughter joining the police, my daughter might get hurt, it's a dangerous job'. "I got masses of abuse from various people in the community. I was called a coconut, a sell-out. "The police have still a long way to go breaking down barriers and trying to rule out the negative perception people have of the force. "The only way we can do that is get more people like myself out in the community talking to the community, so the community can see the police force is not a white organisation and there are people like them in the force." West Yorkshire Police currently employs only 58 female BME officers - none ranked higher than inspector - and has launched a recruitment drive. The force's chief constable Dee Collins told the BBC: "I need people's help to address those issues collectively. "It's no good me just talking about it, I need to meet with people to address those concerns and demonstrate repeatedly that we mean what we say, that we want to change. "We definitely want to have a much more inclusive police force." "I remember as a PC driving around Bradford, people staring and saying 'Look there's an Asian lady driving a police car'. "But over the years, having worked in Bradford, mainly in an Asian community, with other Asian women, I've had some fantastic relationships with them, mainly because I understand the language and I understand the culture as well. "I hope they see a role model in me, and see if they want a career in the police, then they can do it." Shadow home secretary Diane Abbott said: "We haven't made sufficient progress, the government should do more to push this agenda. "It's about effective policing and community-based policing and some forces like the Met have shown what can be done."